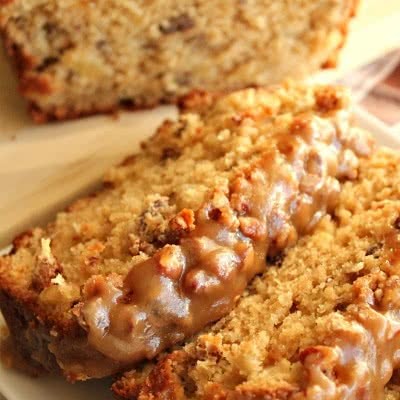 You are going to love this moist Apple Praline Bread made with fresh apples. The praline topping is our favorite part of this bread. It’s so good you will want to eat it out of the pan with a spoon. But we resisted and spooned it over the bread. It’s the perfect bread for breakfast, snack or a side with soup or salad. A delicious moist apple bread with a praline topping that is out of this world! Heat oven to 350 degrees. Grease and flour a 9 x 5 inch loaf pan. In a large mixing bowl beat the sour cream, brown sugar, eggs, and vanilla on low speed for about 2 minutes until well blended. Add in flour, baking powder, baking soda, salt, cinnamon and nutmeg. Mix until well combined. Then fold in the chopped apples and 1/2 cup of the chopped pecans. Spoon batter into the prepared pan. Sprinkle with remaining pecans. Pressing them lightly into the batter. Bake for about 55 minutes or until a toothpick inserted comes out clean. If the bread is browning too fast, tent foil loosely over the top of bread to prevent it from burning. Cool in the pan for about 15 minutes then transfer to a wire rack to finish cooling. While the bread is cooling make the praline topping. In a small saucepan, combine brown sugar and butter. Bring to a boil over medium heat stirring constantly. Lower the heat and simmer lightly for about one minute, stirring constantly until the sauce thickens. Remove from heat and drizzle over the bread. Cool and then slice and serve. Any recommendations for the type of apple?? Hi Tiffany. We have used Gala Apples and Pink Lady. But you could use whatever you have on hand. This was amazing! I used Granny Smith Apples, peeled of course. Thank you for the recipe! !